The ancient and medieval settlement and fortress Rahovets located near the northern Bulgarian town of Gorna Oryahovitsa, and the city of Veliko Tarnovo was also used as a rock shrine by the Ancient Thracians, according to archaeologist Iliyan Petrakiev from the Veliko Tarnovo Regional Museum of History. Petrakiev, together with Maya Ivanova from the Gorna Oryahovitsa Museum of History, is the lead archaeologist in the first archaeological excavations of the Rahovets Fortress since 1991. He says the structure and planning of Rahovets, which is to be granted a “monument of culture” status as a settlement and fortress is similar to those of the ancient and medieval rock city of Perperikon (Perperik) in the Eastern Rhodope Mountains in Southern Bulgaria. In his words, the rocky hill of Rahovets was inhabited in the Iron Age as well as during the Middle Ages, and since the settlement and fortification actually enclose a rock, in the period of Ancient Thrace the place was probably used for both defensive and religious purposes, i.e. as a shrine. “These types of settlements are almost always built at inaccessible locations, up on high rocks with clear visibility of the surrounding area. The place is also suitable for religious rites. We know that the sun was a powerful force in the Ancient Thracians’ religion," Petrakiev says, as quited by Radio Focus Veliko Tarnovo. 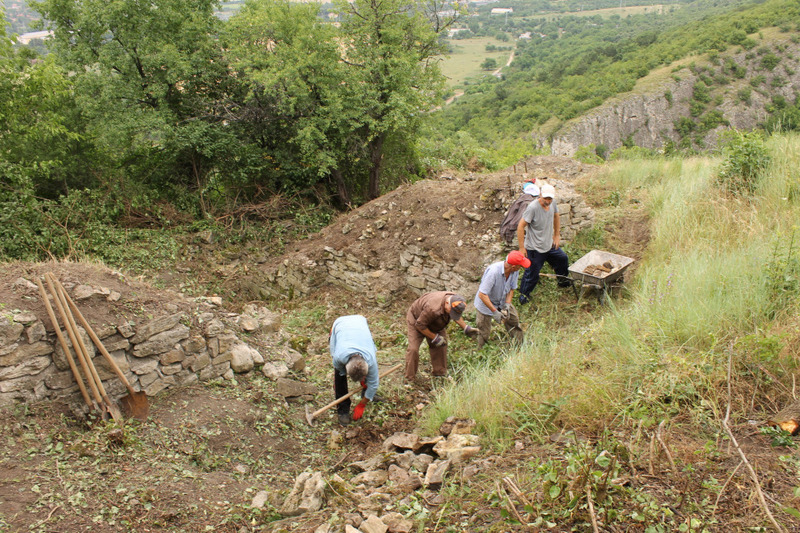 He adds that together with his colleagues and a total of 10 workers they have been working on the main fortress gate in the southeast part of the Rahovets hill. The discovery of a large quantity of ancient ceramics is evidence that the site was inhabited by the Ancient Thracians during the Iron Age. “We have discovered abundant Thracian pottery around the southeast gate. We have found a structure from the Thracian period, which was most probably a fortification that remains beneath the medieval fortress walls. In fact, the builders in the Middle Ages probably built upon the existing Thracian fortress wall. We should be able to prove by the end of the archaeological season whether this was a Thracian settlement with fortifications," Petrakiev points out, adding that there are relatively few Thracian cities with fortress walls that have been explored in Bulgaria. The archaeologist also says that the excavations of the Rahovets Fortress may indicate that it was one of the first fortifications ever built in the history of the region of today’s Central North Bulgaria, and that it was probably erected by the Thracian tribe Krobyzoi. “For the time being, our data is sparse since we set out to study the Rahovets Fortress from the Middle Ages but so far our findings have to do mostly with Ancient Thrace," Petrakiev elaborates. The archaeologist hopes that there will be funding for turning the Rahovets Fortress into a destination for cultural, historical, and archaeological tourism; this entails building proper tourist infrastructure to make the site accessible for visitors. That way it could become a cultural attraction similar to Perperikon in Southern Bulgaria. “Perperikon has been excavated for more than 10 years, and with lots of funding but if it can emerge as a serious tourist destination, why can’t the Rahovets Fortress become the same? Here we have rather preserved solid walls. The inside of the fortress has never been excavated which means we have a deep archaeological layer whose proper exploration will take years," Petrakiev explains. He concludes by revealing that the excavations of the Rahovets Fortress will be completed on July 20, 2015. He hopes that in 2016 the exploration of the site will be awarded funding from the Bulgarian government since the present excavations are carried out only with funding from the Gorna Oryahovitsa Municipality; no funding from the central government has been sought out in 2015 because of the requirement that the respective archaeological site was excavated the previous year as well. The excavations of Rahovets are consulted by Prof. Dr. Hitko Vatchev who participated in the only archaeological digs at Rahovets so far back in the late 1980s. The Veliko Tarnovo archaeologists originally planned to focus on establishing the stratification of the archaeological layers in the Rahovets Fortress, whose lifespan was some 2,000 years, with its height in the High and Late Middle Ages when it was one of the fortifications defending the Bulgarian capital Tarnovgrad from the north.